In the middle of the 1980s, after lobbying from businesses and Chinese community leaders, a series of decorative gates were built to mark the various entrances to Montreal’s Chinatown. One of these is found at the corner of de la Gauchetière and Jeanne-Mance, the western end of the district. But to me, the real signal that I have entered Chinatown is when I pass beneath the Wing’s Nouilles Chinoises neon sign, one block east at Côté Street. The Wing Building is the oldest surviving structure in Chinatown, built in 1826 and designed by James O’Donnell, who had moved to Montreal from New York to oversee the construction of a somewhat more illustrious project. Over the past 186 years, it has served as a military school, paper box factory and warehouse, according to Barry Lazar and Tamsin Douglas’ Guide to Ethnic Montreal. These days, the building is known for a distinctly eggy smell: this is the main supplier of fortune cookies to Chinese restaurants across eastern Canada. The first time I came across Miss Villeray, she was looking a bit worse for the wear, holding fort above a neighbourhood bar that had seen better days. In 2008, the bar was sold to an ambitious entrepreneur who fixed it up without throwing away the original decor. It’s now a haunt for Villeray’s trendy thirtysomethings. Not my crowd, but I always appreciate the fact that Miss Villeray was restored to her former glory. The Miss Villeray officially opened on July 28, 1960, and one of its first patrons was the Minister of Public Work and Hydraulic Resources, René Lévesque, along with his friends, the mighty but charming professional wrestler Johnny Rougeau, and radio personality, singer and actress Lucille Dumont. 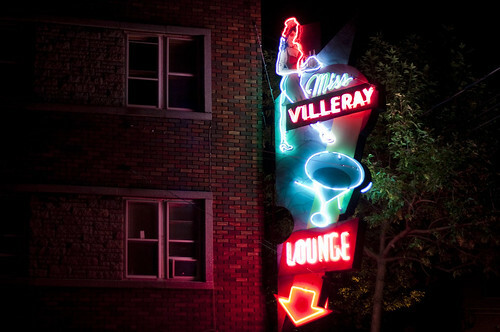 Who was the woman who inspired the Miss Villeray sign? According to 83-year-old resident C. Riverin, Miss Villeray was the name given to a very popular neighbourhood woman in the years following WWII. This sweet woman had the reputation for inspiring love. Both women and men were said to fall in love with her one after another. There you have it. A beauty preserved in neon gas. 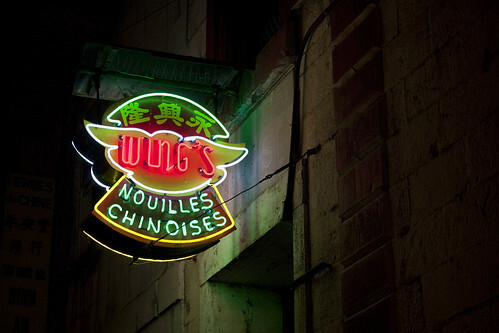 This entry was written by Christopher DeWolf , posted on Wednesday February 01 2012at 11:02 pm , filed under Architecture, Art and Design, Canada, Heritage and Preservation, History and tagged Chinatown, Exploring the City, Montreal, Neon, Signage . Bookmark the permalink . Post a comment below or leave a trackback: Trackback URL.